When Georgia high school student Tiambrya Jenkins was in ninth grade, the teen, who is black, got into a fight with a white classmate. Both girls were transferred to an alternative high school as a result, but the white student returned to regular school after 90 days. Jenkins had to stay in the alternative school for a year. Jenkins’ experience isn't unusual for black female students, who are routinely given harsher punishments than white students -- even though no evidence shows black students are more likely to misbehave, according to a report Tuesday from the National Women’s Law Center and the NAACP Legal Defense and Educational Fund. The report outlines the discipline disparities for African-American girls, and notes that pervasive racial and gender biases in education often prevent students from succeeding. 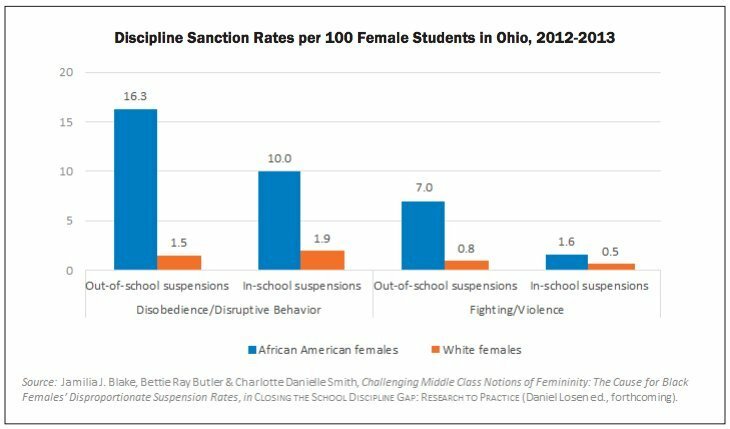 While black male students are the most frequently suspended, African-American girls also disproportionately receive harsh punishments, the report says. The discipline disparities for black girls are likely related to racial and gender stereotypes that portray African-American females as “loud, confrontational, assertive, and provocative,” the report says. 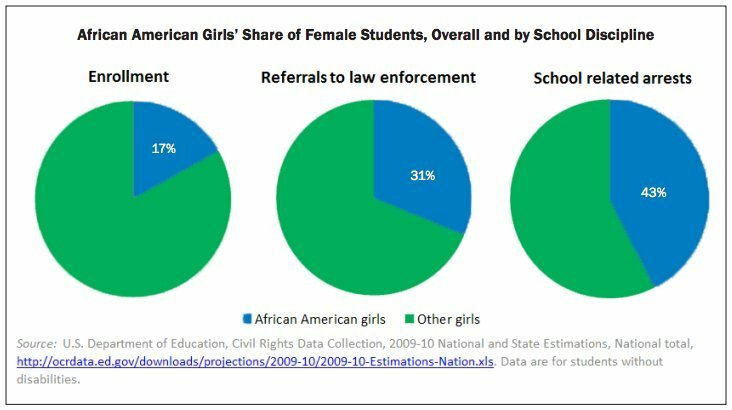 The graph below –- based on data from the U.S. Department of Education -- shows that a far greater percentage of African-American girls are disciplined than their population would suggest. 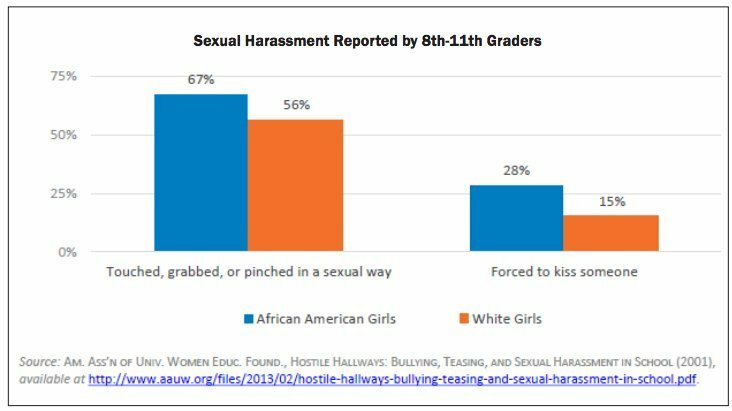 African-American females also are more likely to face sexual harassment in school than their white female peers, notes the report. They are more likely to be held back, and to score lower on standardized tests than white girls. The report notes that these academic disparities are likely related to the fact that teachers in schools with large African-American populations typically have less experience and less access to educational resources. 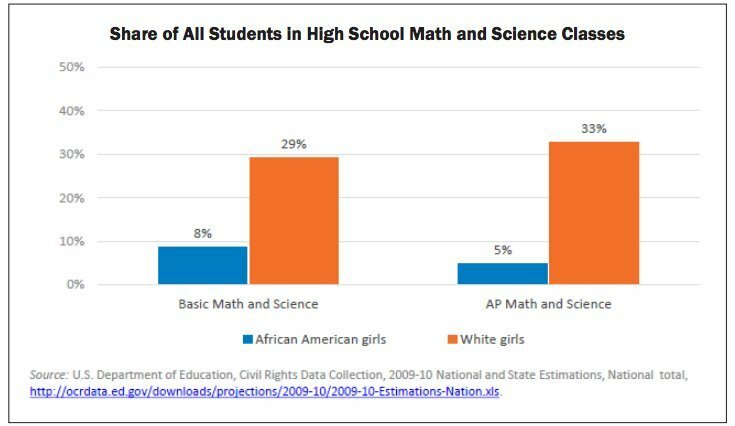 African-American girls are less likely than white girls to participate in after-school activities or to take math and science classes. According to data from 2009, African-American girls had lower grade-point averages than girls from any other racial or ethnic group, the report says. Fatima Goss Graves, vice president for education and employment at the National Women’s Law Center, told The Huffington Post of at least one bright spot in the report. Evidence suggests that black girls are more likely than white or Hispanic girls to consider themselves leaders, and to express higher leadership aspirations. Graves noted that “there’s in some ways a disconnect with the opportunities that are there” for African-American girls. "African-American boys and girls still disproportionately attend high poverty racially isolated schools," Graves said. "That means they have less access to some of the resources that are present in other schools -- whether we’re talking about access to teachers who are trained in the subject they're teaching, or access to A.P. courses, or access to certain high-level STEM courses ... That makes a difference." Sherrilyn A. Ifill, president of the NAACP Legal Defense Fund, said in a press release that the report highlights the need for change. “Our educational policies and practices must open the doors of opportunity for all -– regardless of race or gender. Only then will we fulfill the promise of Brown v. Board of Education, the landmark ruling that invalidated legal segregation in America 60 years ago,” Ifill said.